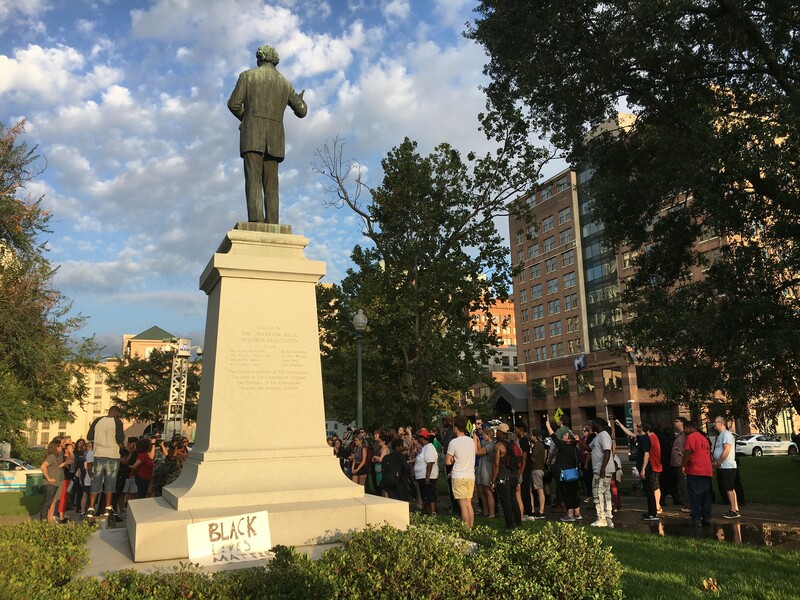 Tensions in Memphis continue to rise around the city's two Confederate statues, as Tuesday evening close to 50 individuals gathered around the Jefferson Davis statue in Memphis Park on Front to rally for its removal. The demonstrators, who had a bullhorn and signs, were joined by nearly a dozen policemen and a hand full of individuals who support the statue. 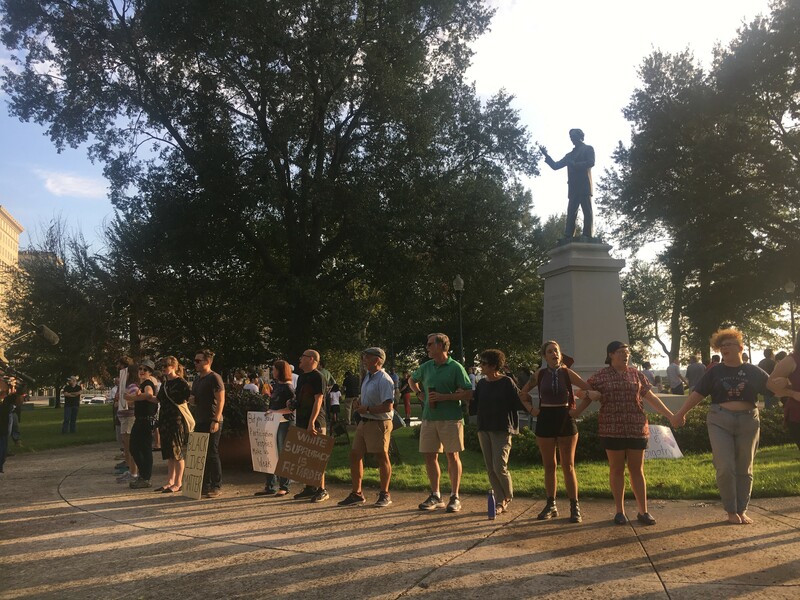 At one point the group of demonstrators circled around the statue, linked hands, and chanted, "Jefferson Davis has got to go, hey hey, ho ho" and "no Trump, no KKK, no Facist USA." Counter-protestors were then evoked and verbal altercations between the two groups led the Confederate statue supporters to be escorted from the park by police. 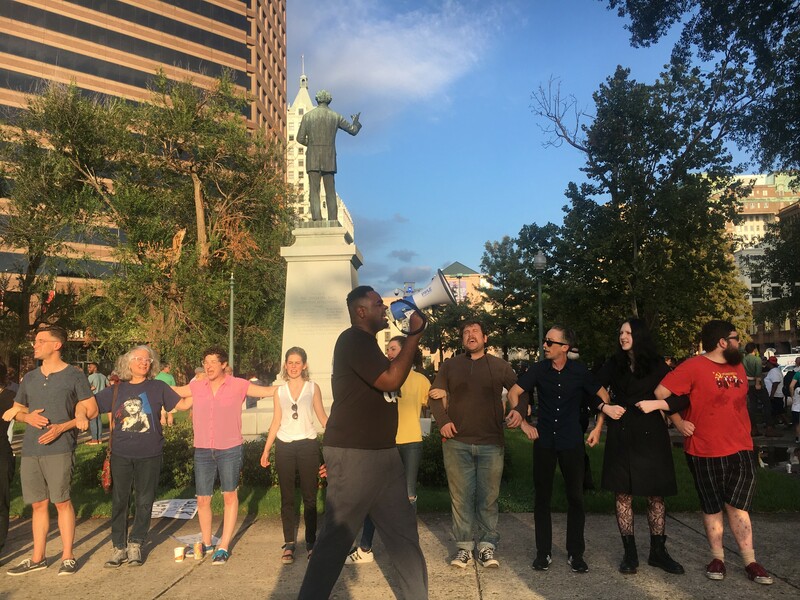 Tami Sawyer, one of the local activists leading the charge for the Confederate statues' removal, says she and others won't stop applying pressure like Tuesday's demonstration to Mayor Jim Strickland's administration until the statues are removed. She believes there is more the mayor can do outside of the plan to file a waiver announced Monday. "We're not going to stand down," Sawyer said. "Because we can get the statues down quicker. The City knows what loopholes there are." Sawyer says she and six other activists, as well as members of the faith community created a list of demands that they plan to share with the City. The list includes demands for Gov. Bill Haslam to repeal the Tennessee Heritage Protection Act's inclusion of Confederate war symbols. 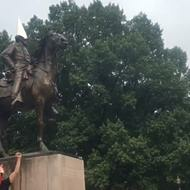 They also demand that Strickland and the City Council take immediate action to have the Jefferson Davis and Nathan Bedford Forrest statues removed from the city, by using "alternative methods." 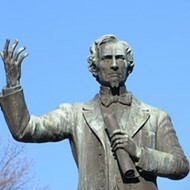 Once the statues are removed, Sawyer says the group requests that the City, as well as private funders and individuals come together to commission statues of Martin Luther King, Ida B. Wells, or "any other notable figure who will unite our city." 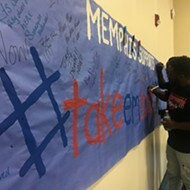 Other demands touched on the City's focus on the criminal justice system and community policing, emphasizing the need for educational and empowerment programs for Memphis' youth. 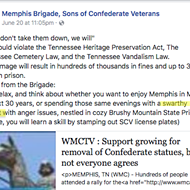 Finally, Sawyer says that the City should ban Sons of Confederate Veterans and white supremacy groups from holding conventions and meetings in the city. "Our demands are simple; they are easy," she said. 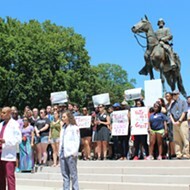 "These statues can come down, white supremacy can really be banned in this city, and we can move forward to continue to focus on social justice issues that will unite and really bring equality and economic freedom for all people in Memphis." 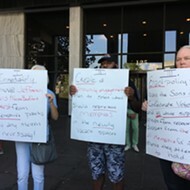 As the rally died down, Sawyer assured the group that they will continue to take action and put pressure on the City until they can get a "solid, solid way to get them down."